The use of doubly fed induction generators (DFIGs) in wind turbines has become quite common over the last few years. These machines provide variable speed and are driven with a power converter which is sized for a small percentage of the turbine-rated power. This paper presents a detailed model of induction generator coupled to wind turbine system. Modeling and simulation of induction machine using vector control computing technique is done. DFIG wind turbine is an integrated part of distributed generation system. Therefore, any abnormalities associates with grid are going to affect the system performance considerably. Taking this into account, the performance of DFIG variable speed wind turbine under network fault is studied using simulation developed in MATLAB/SIMULINK. Fig. 4 Speed and torque during balance condition. This paper presents a study of the dynamic performance of variable speed DFIG coupled with wind turbine. 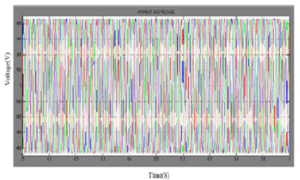 The dynamic behavior of DFIG under power system disturbance was simulated using MATLAB/SIMULINK.Accurate transient simulations are required to investigate the influence of the wind power on the power system stability. The DFIG considered in this analysis is a wound rotor induction generator with slip rings. The stator is directly connected to the grid and the rotor is interface via a back to back power converter. Power converter are usually controlled utilizing vector control techniques which allow the decoupled control of both active and reactive power flow to the grid. In the present investigation, the dynamic DFIG performance is presented for both normal and abnormal grid conditions. The control performance of DFIG is satisfactory in normal grid conditions and it is found that, both active and reactive power maintains a study pattern in spite of fluctuating wind speed and net electrical power supplied to grid is maintained constant. T. Brekken, and N. Mohan, “A novel doubly-fed induction wind generator control scheme for reactive power control and torque pulsation compensation under unbalanced grid voltage conditions”, IEEE PESC Conf Proc., Vol 2, pp. 760-764, 2003. L. Xu and Y. Wang, “Dynamic modeling and control of DFIG-based wind turbines under unbalanced network conditions”, IEEE Trans. On Power System, Vol 22, Issues 1, pp. 314-323, 2007. F.M. Hughes, O. Anaya-Lara, N. Jenkins, and G. Strbac, “Control of DFIG based wind generation for power network support”, IEEE Trans. On Power Systems, Vol 20, pp. 1958-1966, 2005. S. Seman, J. Niiranen, S. Kanerva, A. Arkkio, and J. Saitz, “Performance study of a doubly fed wind-power induction generator Under Network Disturbances”, IEEE Trans. on Energy Conversion, Vol 21, pp. 883-890, 2006. T. Thiringer, A. Petersson, and T. Petru, “Grid disturbance response of wind turbines equipped with induction generator and doubly-fed induction generator”, in Proc. IEEE Power Engineering Society General Meeting, Vol 3, pp. 13-17, 2003. This paper presents a fuzzy logic controller (FLC)-based single-ended primary-inductor converter (SEPIC) for maximum power point tracking (MPPT) operation of a photovoltaic (PV) system. The FLC proposed presents that the convergent distribution of the membership function offers faster response than the symmetrically distributed membership functions. The fuzzy controller for the SEPIC MPPT scheme shows high precision in current transition and keeps the voltage without any changes, in the variable-load case, represented in small steady-state error and small overshoot. The proposed scheme ensures optimal use of PV array and proves its efficacy in variable load conditions, unity, and lagging power factor at the inverter output (load) side. The real-time implementation of the MPPT SEPIC converter is done by a digital signal processor (DSP), i.e., TMS320F28335. The performance of the converter is tested in both simulation and experiment at different operating conditions. The performance of the proposed FLC-based MPPT operation of SEPIC converter is compared to that of the conventional proportional–integral (PI)-based SEPIC converter. The results show that the proposed FLC-based MPPT scheme for SEPIC can accurately track the reference signal and transfer power around 4.8% more than the conventional PI-based system. Fig. 1. Circuit diagram for the FLC based MPPT of SEPIC converter. Fig. 2. Overall control scheme for the proposed FLC-based MPPT scheme for the SEPIC converter. Fig. 3. (a) Irradiation (W/m2). (b) Reference voltage tracks the maximum power . Fig. 4. Experimental waveforms of the SEPIC converter at (a) 15% load condition and (b) full-load condition. Fig. 5. Output (top) voltage and (bottom) current waveforms of the SEPIC converter with the conventional PI control scheme. Fig. 6. Output (top) voltage and (bottom) current waveforms of the SEPIC converter with the proposed FLC-based MPPT scheme. Fig. 7. Error signal (difference between Vreal and Vref ) of the proposed FLC-based SEPIC converter. Fig. 8. Variable-load inverter current, voltage, and voltage error signals. Fig. 9. Inverter current, voltage, and voltage error signals with lagging power factor load for the proposed FLC-based SEPIC and inverter system. An FLC-based MPPT scheme for the SEPIC converter and inverter system for PV power applications has been presented in this paper. A prototype SEPIC converter-based PV inverter system has also been built in the laboratory. The DSP board TMS320F28335 is used for real-time implementation of the proposed FLC and MPPT control algorithms. The performance of the proposed controller has been found better than that of the conventional PI-based converters. Furthermore, as compared to the conventional multilevel inverter, experimental results indicated that the proposed FLC scheme can provide a better THD level at the inverter output. Thus, it reduces the cost of the inverter and the associated complexity in control algorithms. Therefore, the proposed FLC-based MPPT scheme for the SEPIC converter could be a potential candidate for real-time PV inverter applications under variable load conditions. K.M. Tsang andW. L. Chan, “Fast acting regenerative DC electronic load based on a SEPIC converter,” IEEE Trans. Power Electron., vol. 27, no. 1, pp. 269–275, Jan. 2012. S. J. Chiang, H.-J. Shieh, and M.-C. Chen, “Modeling and control of PV charger system with SEPIC converter,” IEEE Trans. Ind. Electron., vol. 56, no. 11, pp. 4344–4353, Nov. 2009. M. G. Umamaheswari, G. Uma, and K. M. Vijayalakshmi, “Design and implementation of reduced-order sliding mode controller for higher-order power factor correction converters,” IET Power Electron., vol. 4, no. 9, pp. 984–992, Nov. 2011. A. A. Fardoun, E. H. Ismail, A. J. Sabzali, and M. A. Al-Saffar, “New efficient bridgeless Cuk rectifiers for PFC applications,” IEEE Trans. Power Electron., vol. 27, no. 7, pp. 3292–3301, Jul. 2012. An active power filter implemented with a four-leg voltage-source inverter using a predictive control scheme is presented. The use of a four-leg voltage-source inverter allows the compensation of current harmonic components, as well as unbalanced current generated by single-phase nonlinear loads. A detailed yet simple mathematical model of the active power filter, including the effect of the equivalent power system impedance, is derived and used to design the predictive control algorithm. The compensation performance of the proposed active power filter and the associated control scheme under steady state and transient operating conditions is demonstrated through simulations and experimental results. Fig. 1. Three-phase equivalent circuit of the proposed shunt active power filter. Fig. 2. dq-based current reference generator block diagram. Fig. 3. Simulated waveforms of the proposed control scheme. (a) Phase to neutral source voltage. (b) Load Current. (c) Active power filter output current. (d) Load neutral current. (e) System neutral current. (f) System currents. (g) DC voltage converter. Fig. 4. Experimental transient response after APF connection. (a) Load Current iLu , active power filter current iou , dc-voltage converter vdc , and system current isu . 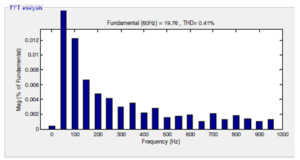 Associated frequency spectrum. (c) Voltage and system waveforms, vsu and isu , isv , isw . (d) Current reference signals i*ou , and active power filter current iou (tracking characteristic). Fig. 5. Experimental results for step load change (0.6 to 1.0 p.u.). Load Current iLu , active power filter current iou , system current isu , and dc-voltage converter vdc . Fig. 6. Experimental results for step unbalanced phase u load change (1.0 to 1.3 p.u.). (a) Load Current iLu , load neutral current iLn , active power filter neutral current ion , and system neutral current isn . (b) System currents isu , isv , isw , and isn . Improved dynamic current harmonics and a reactive power compensation scheme for power distribution systems with generation from renewable sources has been proposed to improve the current quality of the distribution system. Advantages of the proposed scheme are related to its simplicity, modeling, and implementation. The use of a predictive control algorithm for the converter current loop proved to be an effective solution for active power filter applications, improving current tracking capability, and transient response. Simulated and experimental results have proved that the proposed predictive control algorithm is a good alternative to classical linear control methods. The predictive current control algorithm is a stable and robust solution. Simulated and experimental results have shown the compensation effectiveness of the proposed active power filter. M. Aredes, J. Hafner, and K. Heumann, “Three-phase four-wire shunt active filter control strategies,” IEEE Trans. Power Electron., vol. 12, no. 2, pp. 311–318, Mar. 1997. S. Naidu and D. Fernandes, “Dynamic voltage restorer based on a fourleg voltage source converter,” Gener. Transm. Distrib., IET, vol. 3, no. 5, pp. 437–447, May 2009. N. Prabhakar and M. Mishra, “Dynamic hysteresis current control to minimize switching for three-phase four-leg VSI topology to compensate nonlinear load,” IEEE Trans. Power Electron., vol. 25, no. 8, pp. 1935– 1942, Aug. 2010. 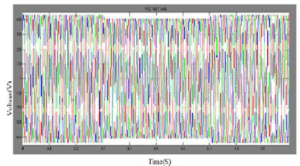 V. Khadkikar, A. Chandra, and B. Singh, “Digital signal processor implementation and performance evaluation of split capacitor, four-leg and three h-bridge-based three-phase four-wire shunt active filters,” Power Electron., IET, vol. 4, no. 4, pp. 463–470, Apr. 2011. The theory of reference frames has been effectively used as an efficient approach to analyze the performance of the induction electrical machines. This paper presents a step by step Simulink implementation of an induction machine using dq0 axis transformations of the stator and rotor variables in the arbitrary reference frame. For this purpose, the relevant equations are stated at the beginning, and then a generalized model of a three-phase induction motor is developed and implemented in an easy to follow way. The obtained simulated results provide clear evidence that the reference frame theory is indeed an attractive algorithm to demonstrate the steady-state behavior of the induction machines. In this paper, an implementation and dynamic modeling of a three-phase induction motor using Matlab/Simulink are presented in a step-by-step manner. The model was tested by two different ratings of a small and large induction motors. The two simulated machines have given a satisfactory response in terms of the torque and speed characteristics. Also, the model was evaluated by Matlab m-file coding program. Both methods have given the same results for the same specifications of the three phase induction motors used in this simulation. This concludes that the Matlab/Simulink is a reliable and sophisticated way to analyze and predict the behaviour of induction motors using the theory of reference frames. D. C. White and H. H. Woodson, “Electromechanical Energy Conversion”, John Wiley and Sons, New York, 1959. M. L. de Aguiar, M. M. Cad, “The concept of complex transfer functions applied to the modeling of induction motors”, Power Engineering Society Winter Meeting, 2000, pp. 387–391. vector control with rotor resistance identification”, IEEE Transactions on Power Electronics, vol. 12, No. 3, May 1997, pp. 495–506. In order to eliminate the common-mode (CM) leakage current in the transformer less photovoltaic (PV) systems, the concept of the virtual dc bus is proposed in this paper. By connecting the grid neutral line directly to the negative pole of the dc bus, the stray capacitance between the PV panels and the ground is bypassed. As a result, the CM ground leakage current can be suppressed completely. Meanwhile, the virtual dc bus is created to provide the negative voltage level for the negative ac grid current generation. Consequently, the required dc bus voltage is still the same as that of the full-bridge inverter. 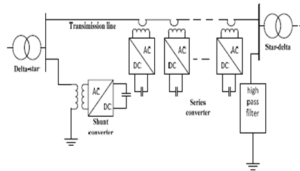 Based on this concept, a novel transformer less inverter topology is derived, in which the virtual dc bus is realized with the switched capacitor technology. It consists of only five power switches, two capacitors, and a single filter inductor. Therefore, the power electronics cost can be curtailed. This advanced topology can be modulated with the uni polar sinusoidal pulse width modulation (SPWM) and the double frequency SPWM to reduce the output current ripple. As a result, a smaller filter inductor can be used to reduce the size and magnetic losses. The advantageous circuit performances of the proposed transformer less topology are analyzed in detail, with the results verified by a 500-W prototype. The concept of the virtual DC bus is proposed to solve the CM current problem for the transformerless grid-connected PV inverter. By connecting the negative pole of the DC bus directly to the grid neutral line, the voltage on the stray PV capacitor is clamped to zero. This eliminates the CM current completely. Meanwhile, a virtual DC bus is created to provide the negative voltage level. The required DC voltage is only half of the half bridge solution, while the performance in eliminating the CM current is better than the full bridge based inverters. Based on this idea, a novel inverter topology is proposed with the virtual DC bus concept by adopting the switched capacitor technology. It consists of only five power switches and a single filter inductor. The proposed topology is especially suitable for the small power single phase applications, where the output current is relatively small so that the extra current stress caused by the switched capacitor does not cause serious reliability problem for the power devices and capacitors. With excellent performance in eliminating the CM current, the virtual DC bus concept provides a promising solution for the transformerless grid-connected PV inverters. Alexander Eigels Emanuel, John A. McNeill “Electric Power Quality”. Rev. Energy Environ 1997, pp. 263-303. I Nita R. Patne, Krishna L. Thakre “Factor Affecting Characteristics Of Voltage Sag Due to Fault in the Power System” Serbian Journal Of Electrical engineering. 5, no.1, May2008, pp. 171-182. R. Enslin, “Unified approach to power quality mitigation,” in Proc. IEEE Int. Symp. Industrial Electronics (ISIE ’98), vol. 1, 1998, pp. 8– 20. Singh, K. Al-Haddad, and A. Chandra, “A review of active filters for power quality improvement,” IEEE Trans. Ind. Electron. vol. 46, no. 5, pp. 960–971, 1999. Presently, the quality of power supplied is essential to many customers. Power quality (PQ) is a valued utility service where many customers are prepared to pay and get it. In the future, distribution system operators ought to decide, to provide their customers with distinct PQ ranges at different prices. Here, in this paper, a new control action to improve and maintain and enhance the power quality of an electrical power system is proposed in this paper. Fuzzy based distributed power flow controller (DPFC) is designed and put into action to compensate the voltage imbalances arising in a power system. This customized DPFC is an advanced FACTS device, which has its structure analogous to unified power flow controller (UPFC). DPFC comprises of both series and shunt converters, in which its three phase series converter is distributed over the transmission line as several single phase static converters ensuring high controllability and reliability at a low cost compared to an UPFC. A central controlling circuit is designed to supply reference signals to each of the individual controlling circuits of both series and shunt converters. This customized device is applied to a single machine infinite bus power system having nonlinear loads connected to it and is simulated in MATLAB/Simulink environment by using OPAL-RT 5600 Real-time digital Simulator. The results demonstrate the validation of proposed technique to enhance the power quality. The work is presented to provide a solution for maintaining Power Quality at the distribution end, compensation of harmonics in grid voltage and in load currents. In order to consummate specified intentions in this paper a new concept for controlling power quality problems was proposed and implemented. 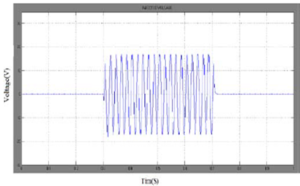 By putting the customized device into action, results were analyzed for voltage dips and their mitigations for a three phase source with non-linear loads. The DPFC is modeled by positioning three control circuits designed independently. In this paper we also proposed and implemented the concept of fuzzy logic controller for having better controlling action, which will help in minimization/elimination of harmonics in the system. As compared to all other facts devices the Fuzzy based DPFC converter effectively controls all power quality problems and with this technique we can put THD to 3.04% proving the effectiveness of the proposed controller. Divan and H. Johal, “Distributed facts-A new concept for realizing grid power flow control,” in IEEE 36th Power Electron. Spec. Conf. (PESC), 2005, pp. 8–14. K K. Sen, “Sssc-static synchronous series compensator: Theory, modeling, and application”,IEEE Trans. Power Del., vol. 13, no. 1, pp. 241–246, Jan. 1998. Gyugyi, C.D. Schauder, S. L.Williams, T. R. Rietman, D. R. Torgerson, and A. Edris, “The unified power flow controller: A new approach to power transmission control”, IEEE Trans. Power Del., vol. 10, no. 2, pp. 1085– 1097, Apr. 1995. 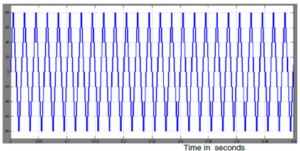 Mohaddes, A. M. Gole, and S. Elez, “Steady state frequency response of statcom”, IEEE Trans. Power Del., vol. 16, no. 1, pp. 18–23, Jan. 2001. The flexible ac-transmission system (FACTS) family called distributed power flow controller (DPFC). The DPFC is derived from the unified power flow controller (UPFC) with eliminated common dc link. The active power exchange between the shunt and series converters, which is through the common dc link in the UPFC, is now through the transmission lines at the third harmonic frequency. The DPFC is to use multiple small size single phase converters instead of large size three phase series converter in the UPFC. The large number of series converters provides redundancy, thereby increasing the system reliability. As the D-FACTS converters are single phase and floating with respect to the ground, there is no high voltage isolation required between the phases. The cost of the DPFC system is lower than the UPFC. The DPFC has the same control capability as the UPFC, which comprises the adjustment of the line impedance, the transmission angle, and the bus voltage. Due to the high control capability DPFC can also be used to improve the power quality and system stability, such as low frequency power oscillation damping, voltage sag restoration or balancing asymmetry. The series converter of the DPFC employs the DFACTS concept, which uses multiple small single-phase converters instead of one large-size converter. It is proved that the shunt and series converters in the DPFC can exchange active power at the third-harmonic frequency, and the series converters are able to inject controllable active and reactive power at the fundamental frequency. The DPFC is also used to improving power quality problems such as sag and swell. The reliability of the DPFC is greatly increased because of the redundancy of the series converters. The total cost of the DPFC is also much lower than the UPFC, because no high-voltage isolation is required at the series converter part and the rating of the components of is low. D. Deepak, E. B. William, S. S. Robert, K. Bill, W. G. Randal, T. B. Dale, R. I. Michael, and S. G. Ian, “A distributed static series compensator system for realizing active power flow control on existing power lines”, IEEE Trans. Power Del., vol. 22, no. 1, pp. 642–649, Jan.2007.